How much do welders get paid? Here’s the short answer: it depends. Don’t worry – we’ll cover the more detailed answer a bit later. The truth is, there isn’t a cut-and dry way to fully account for all the factors and circumstances that play a part in determining the size of welders’ paychecks. However, that’s not to say this question can’t be answered at all. We covered this exact topic in a blog first published in the Spring of 2015, and now that we’ve got some updated figures for 2018, we can take another crack at it. It’s important to keep in mind that the data we discuss here may not reflect your perception or personal experiences. However, using this information to look at the big picture can be a helpful in determining what kind of economic prospects you can expect under certain conditions or circumstances. In 2017, the median pay for those who worked as welders, cutters, solderers, and brazers was $40,240 per year, which breaks down to roughly $19.35 an hour. 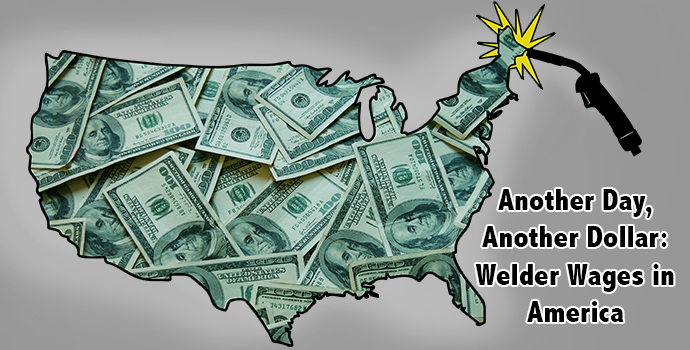 For comparison, the annual median salary for all workers in the United States was $37,690. In case you’re curious, these figures come from the Bureau of Labor Statistics, an arm of the federal government that focuses on measuring labor market activity, working conditions, and price changes in the economy. Now, there’s a few things we need to keep in mind here. First, median salary we mentioned earlier represents a very broad swath of jobs. If you’re welding industrial machinery in a factory or working on a pipeline in the middle of nowhere in the freezing cold, your salary data gets pooled together. Secondly, this figure represents the median annual salary for welders and the like, meaning that 50% of workers in these roles make less than that amount, and 50% make more than that amount. This is different from the mean annual salary, which is how most people calculate average salaries. This may come as no surprise, but the amount of money you can make as a welder varies considerably based on the state that you work in. If we focus on the hourly wages of the top 10% of earners for every state, Alaska, Wyoming, Hawaii, North Dakota, and West Virginia come out on top. 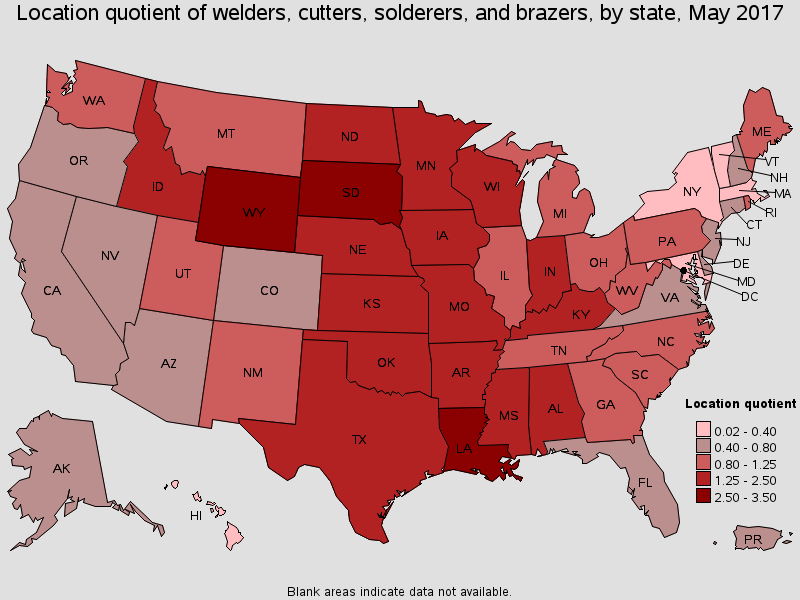 This map, generated by the Bureau of Labor Statistics, shows the saturation of welding jobs in each state, in relation to the United States at large. The darker the state, the greater the concentration of welders. 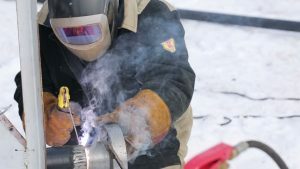 For example, welders in the same state can take home very different paychecks depending on the level of demand for their particular skill set. The recent boom in domestic energy production has increased the demand for welders to build, maintain and repair pipelines or rigs in states like North Dakota and Texas. Industry booms like this often account for large wage discrepancies. In North Dakota, welders in the top earning bracket make about $39 per hour, yet the median wage hovers around $21 per hour (median wage means half of welders earned more than that amount and half earned less). This is the sort of thing you have to keep in mind when you look at wage statistics in a field as diverse as welding. Long term job security, cost of living, and comfort are some other important variables to consider. For instance, Alaska offers the highest welder wages in the country, but the precipitous drop in oil prices and a continued reduction in production has darkened the prospects of an industry that makes up a third of the state’s economy. Oil prices may have nosedived but those barrels still have to get to refineries and consumer markets. That should make a shipbuilding powerhouse like Hawaii an attractive proposition for welders in search of a larger paycheck. The top earners can count on about $40 per hour and the median hourly earnings are a very respectable $31. Yet, like Alaska, Hawaii is likely to be a long way off from family and friends. And even if you’re ready to forego the comfort of familiar faces in order to pad your nest egg, the state’s cost of living might make it a wasted effort. The Cost of Living Index ranks Hawaii as one of the most expensive places to live in the United States. In the end, the Aloha state’s high salary figures may not compare that favorably to other places closer to home when you consider that housing, utilities, groceries, health care and transportation costs are well above the national average. Industry booms often stimulate job growth. However, welders should consider long term job security, working conditions, cost-of-living, and the absence of friends and family before relocating. Job security, cost-of-living, and social concerns such as the proximity of family and friends, are all important considerations when it comes to making a geographical move to secure the best return on your hard work. However, the most critical factor is working conditions, especially when it comes to physical danger. That high paying job in the Baaken Shale loses some of its allure when you consider the dramatic uptick in accidents and fatalities that accompanies a surge in energy sector hiring when oil prices rise. For example, between 2009 and 2013 more than 9,000 claims of injuries related to the booming oil and gas industry were filed with North Dakota’s Workforce Safety & Insurance agency. One of these involved marine veteran Dustin Payne who died when the tanker he was welding exploded. Experts say that the frantic pace of drilling combined with an influx of workers who often lack the relevant training or experience leads to a rise in accidents and fatalities. But, of course, no one should risk their life for a paycheck, so make sure you are properly prepared to do the work and be ready to walk away if safety regulations are not well enforced. There’s certainly money to be made as a pipeline welder, but the hazards and location of the job must also be considered. Fortunately, there are plenty of online resources that provide information about working conditions, and other concerns like long term industry prospects and regional living expenses. For instance, the U.S. Bureau of Labor Statistics compiles a prodigious amount of data about industries and occupations as well as working conditions, accidents, and fatalities. Websites like Payscale.com are also very helpful when it comes to locating information about average incomes and living expenses in different parts of the country. It’s important to remember that numbers don’t always tell the whole story. As we alluded to at the start, these figures may not mirror your experiences or current situation, and they aren’t meant to. In addition to many of the factors we discussed earlier, you should note that all wage data does not include overtime, a major part of many of the astronomical paychecks that you hear about from time to time. Nor do these wages account for non-welding tasks like certified inspectors or supervisors, another reliable means of increasing your income.